In a major breakthrough, scientists at the Gladstone Institutes transformed skin cells into heart cells and brain cells using a combination of chemicals. All previous work on cellular reprogramming required adding external genes to the cells, making this accomplishment an unprecedented feat. The research lays the groundwork for one day being able to regenerate lost or damaged cells with pharmaceutical drugs. In two studies published in Science and Cell Stem Cell, the team of scientists, who were led by Gladstone senior investigator Sheng Ding, PhD, and are part of the Roddenberry Center for Stem Cell Biology and Medicine at Gladstone, used chemical cocktails to gradually coax skin cells to change into organ-specific stem cell-like cells and, ultimately, into heart or brain cells. This discovery offers a more efficient and reliable method to reprogram cells and avoids medical concerns surrounding genetic engineering. Adult hearts have a very limited ability to generate new cells, so scientists have searched for a way to replace cells lost after a heart attack, such as transplanting adult heart cells or stem cells into the damaged heart. However, these efforts have been largely ineffective, as most transplanted adult cells do not survive or integrate properly into the heart, and few stem cells can be coaxed into becoming heart cells. An alternative approach pioneered by Deepak Srivastava, MD, director of cardiovascular and stem cell research at Gladstone, used genes to convert scar-forming cells in the heart of animals into new muscle that improved the function of the heart. A chemical reprogramming approach to do the same may offer an easier way to provide the cues that induce heart muscle to regenerate locally. In the Science study, led by first author Nan Cao, PhD, a postdoctoral fellow in Ding's lab, the researchers used a cocktail of nine chemicals to change human skin cells into beating heart cells. By trial and error, they found the best combination of chemicals to begin the process by changing the cells into a state resembling multipotent stem cells, which can turn into many different types of cells in a particular organ. 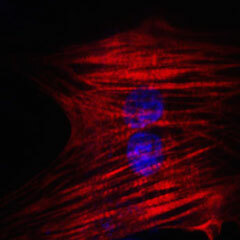 A second cocktail of chemicals and growth factors helped transition the cells to become heart muscle cells. In the second study, authored by Gladstone postdoctoral scholar Mingliang Zhang, PhD, and published in Cell Stem Cell, the scientists created neural stem cells from mouse skin cells using a similar approach. The chemical cocktail again consisted of nine molecules, some of which overlapped with those used in the first study. Over ten days, the cocktail changed the identity of the cells, until all of the skin cell genes were turned off and the neural stem cell genes were gradually turned on. When transplanted into mice, the neural stem cells spontaneously developed into the three basic types of brain cells: neurons, oligodendrocytes, and astrocytes. 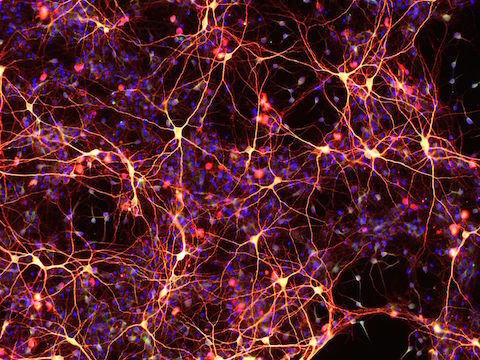 The neural stem cells were also able to self-replicate, making them ideal for treating neurodegenerative diseases or brain injury.